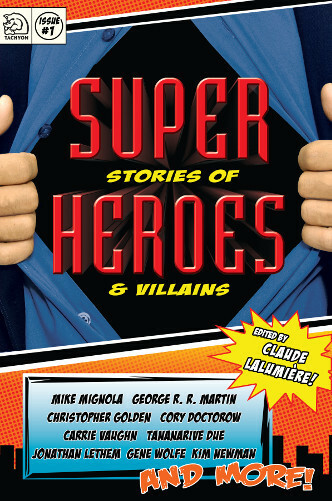 Don D’Ammassa praises Claude Lalumière’s anthology Super Stories of Heroes & Villains. There’s actually quite a range here and readers looking for Marvel Comics style adventures aren’t going to find a lot that suits them. The best stories arguably are those by Paul Di Filippo, Jonathan Lethem, Cory Doctorow, Kelly Link, Carol Emshwiller, and James Patrick Kelly, but the collection is actually so diverse that it feels wrong trying to rank them against one another. Readers not really interested in costumed superheroes might find themselves pleasantly surprised. For more on Super Stories of Heroes & Villains, visit the Tachyon page.